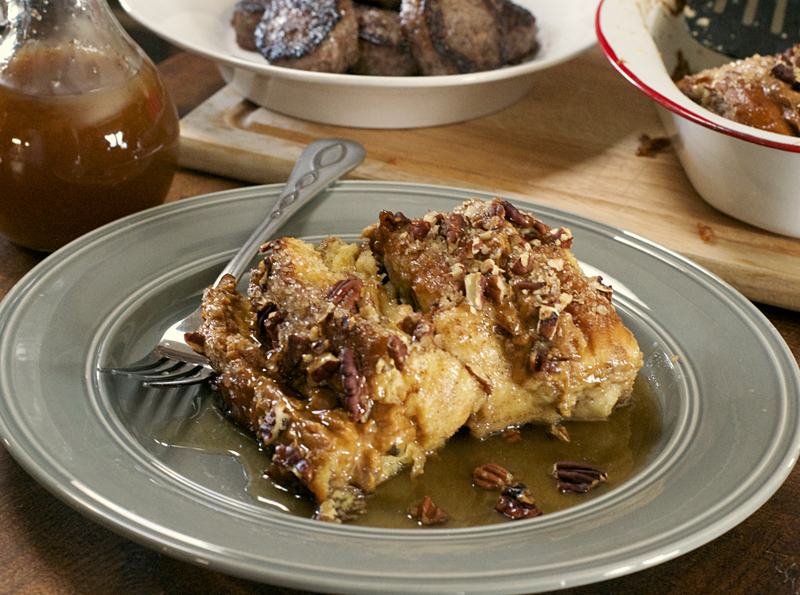 Caramel Pecan Stuffed French Toast-What the "Forks" for Dinner? Whenever I have people over, my first inkling is to feed them………especially when they are helping me with something. Tim’s brother Mark and our sister in love Carrie (Mark calls Carrie’s mother, his mother in love ,because they are not married and I thought is was soooo cute and that makes Carrie our sister in love) came over Sunday morning to help us clean out our gutters. They were coming over early, so I decided to make breakfast. Last Sunday I made the Greek Yogurt Raspberry Pancakes with Homemade Vanilla Syrup for Tim. 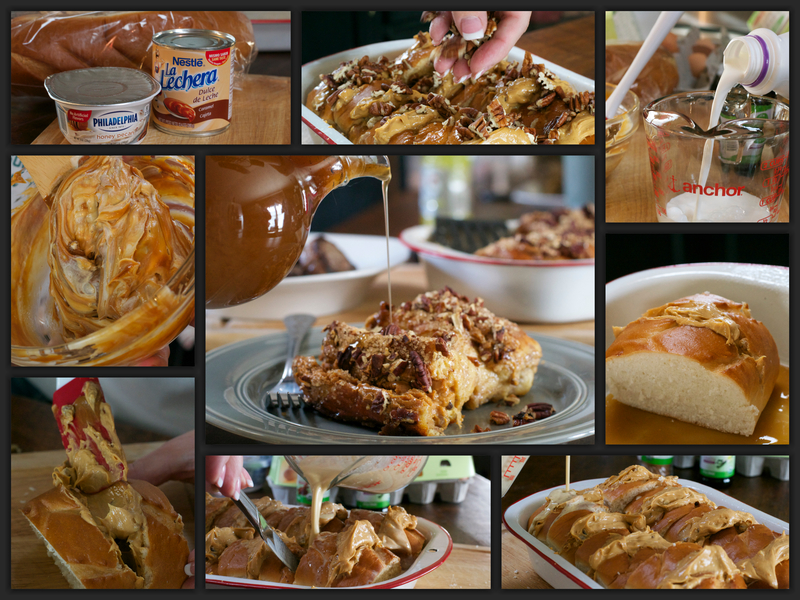 This Sunday it was my turn……..French Toast………… jazzed up French Toast. 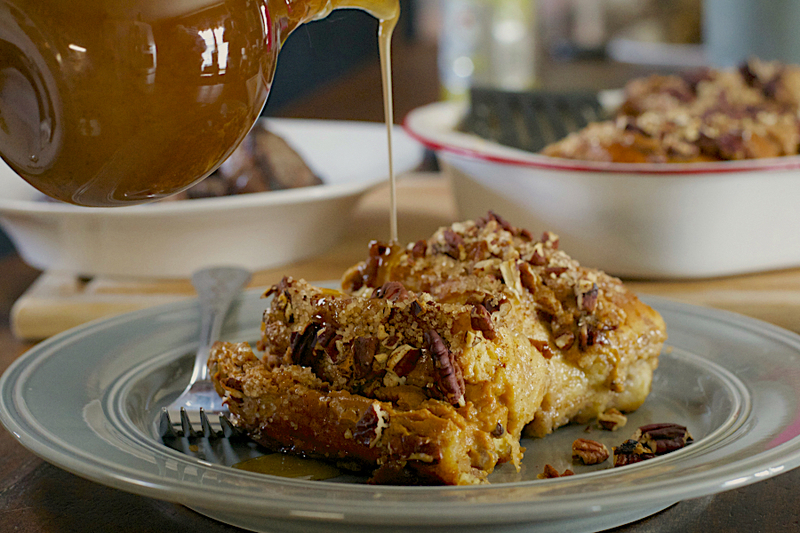 Jazzy Stuffed French Toast! I always get my best ideas at the grocery store! Cream cheese seemed like a natural in the French Toast stuffing department. Low and behold leave it to the people at Kraft to have a cream cheese that was honey pecan flavored……it was like fate….yummy fate! I needed more flavor…….hmmmm…….how about Dulce de Leche caramel……..extra yummy! The one down fall of my local grocery store, is that the types of breads they carry in their bakery is not alway what I am looking for…..I was thinking a Brioche or Challah bread, but it was not to be.They do carry what they call a sweet French bread……it would work. So, back in the kitchen…….I mixed the cream cheese and caramel together…easy enough. Cut the French bread into 2 inch thick slices and cut across the top to form a pocket. Smeared……technical cooking term………the inside of the pockets with the cream cheese mixture. I made a brown sugar butter bed for the slices to set on…….I melted brown sugar and butter, and pored it on the bottom of the pan. I stood the stuffed slices upright, so the filling stayed put while baking. The egg mixture that you normally dip the slices in became kinda like a bath for the slices. I poured it over making sure I had the mixture everywhere …….I used a knife to hold the slices apart so I could pour the mixture in between. Everything needed to be soaked with the egg mixture. At this point, I would have put the mixture in the frig overnight and baked it in the morning……which makes this a great make ahead dish…….but, as usual, I fell into the black hole of time……ok, just didn’t make the dish until the morning…..I had my lazy pants on! It still worked out fine. I sprinkled the top with more pecans and some extra sugar,as if it didn’t have enough already. Into the oven for about 30 minutes and breakfast is served. I used the same Homemade Vanilla Syrup we used with the pancakes……all I can say is this was the best French toast I have ever,ever had…….in my whole life…..and that’s a long time! Just a little tip…….always ask guests if there is something they do not like…….Carrie is not a pecan fan, so I don’t think she enjoyed it as much as Tim,Mark and I did……..but they were our taste testers for this one. Carrie was able to pick the pecans off, I still feel bad that I didn’t ask first. This would make a great Christmas morning breakfast, or make it for a brunch……want ever the event …..make it! It’s super awesome!!!!! In a small bowl, combine brown sugar and butter. Microwave until butter is melted. Stir until well blended. Pour into the bottom of a 9×13 inch baking dish. In another small bowl mix together the cream cheese and dulce de leche. Using a paring knife, cut about 1 inch into the tops of each slice of bread to create a pocket. Stuff the insides of the pockets with 1 1/2 tablespoons or more of the cream cheese caramel mixture. Arrange the stuffed slices of bread in the baking dish, so that the tops of the bread are facing up so the filling does not melt out. Combine half and half, eggs, vanilla, salt and cinnamon in a bowl and pour evenly over bread slices. Sprinkle 1/2 cup chopped pecans and sugar over bread slices. Wrap tightly with plastic wrap. Refrigerate for 4 to 12 hours.Take the casserole out of the fridge for at least 10 minutes. Preheat oven to 350ºF. Make sure all bread slices are evenly coated in egg mixture. Remove French toast from oven and let it cool slightly before serving. Serve Homemade Vanilla Syrup. I only let mine set for about an hour the first time I made it and it turned out fine. 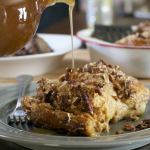 I am so craving french toast right now, this caramel and pecan stuffed fresh toast looks beyond delicious. Thank you Thalia. It really was awesome I am a huge french toast lover!